Tool Help Library makes it easy to enumerate and get info about processes, threads, modules, and heaps. Let’s use it to get a list of running processes. First, take a snapshot by passing TH32CS_SNAPPROCESS flag to CreateToolhelp32Snapshot function. Next, pass the snapshot handle to Process32First, then to Process32Next to get running processes info in a list of PROCESSENTRY32 structures. Next example fills a listview control with the following info of each process. base priority of any threads created by this process. This entry was posted in MFC, Windows API and tagged mfc, Processes, Windows API on 2013.11.29 by Ovidiu Cucu. A previous article shows how to list running processes from command line. Next, we’ll see how to get a list of processes in our own programs. Let’s start by using Process Status API (PSAPI). 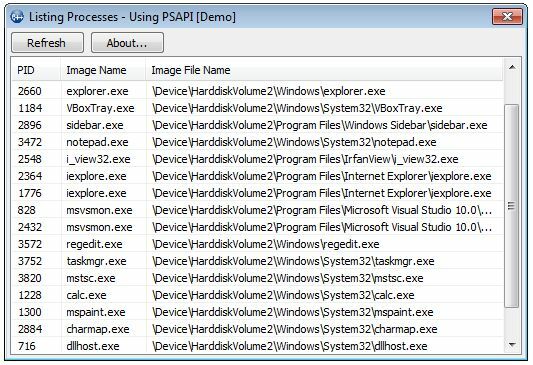 Here is an example that calls EnumProcesses PSAPI function, then fills an array with the found process identifiers. Once having the process identifiers, we can call OpenProcess to get process handles, then use the handles in other functions which get info about processes. Next example fills a listview control with process identifiers, names and image file paths. This entry was posted in MFC, Windows API and tagged mfc, Processes, Windows API on 2013.11.27 by Ovidiu Cucu. 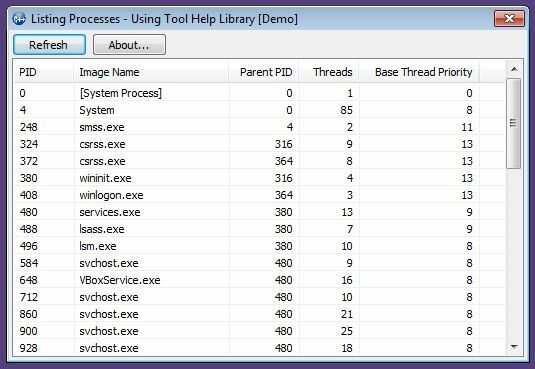 Many users know about Task Manager that allows, between others, to quickly list the currently running processes and get info about each one. 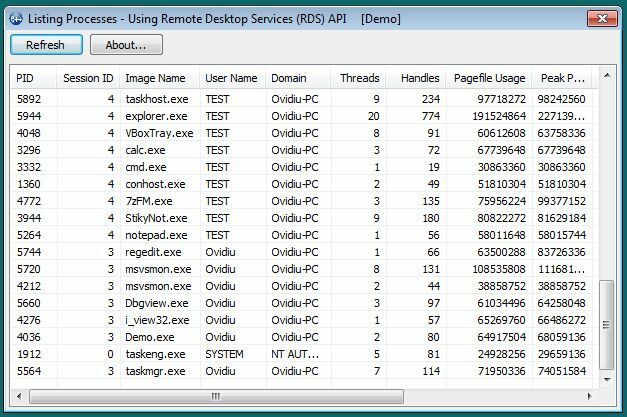 Some advanced users may also deal with Windows Resource Monitor, for real-time monitoring the running processes. 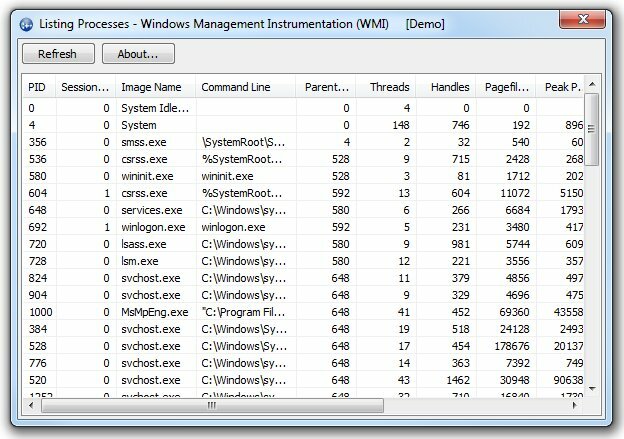 Other ones may use command line tools lile Tasklist or Tlist as well as complex third-party applications, like Sysinternals Process Explorer and Process Monitor. However, let’s say that we have to get a list of running processes and obtain additional info about them in our own application. This series of articles presents several methods for doing that in C/C++ programs, by using Windows API or other libraries. But first, let’s have a brief look at command-line tools. tasklist /m /fi "imagename eq iexplore.exe"
For a complete reference, see the link under Resources section. Tlist isn’t shipped with Windows operating system but is included in Debugging Tools for Windows suite that can be downloaded from Microsoft site. Also, for a complete reference see the link, below. Can we use these tools in our own program? The answer is yes. We can launch tasklist.exe or tlist.exe with CreateProcess, then use a pipe to catch the output, then… But that may be a real overkill, so let’s forget it! Next articles will show how to directly use APIs to list processes. This entry was posted in Windows API and tagged Processes, Windows API on 2013.04.07 by Ovidiu Cucu.